Have you always wanted to go to Baltimore? Whether you want to make it your next weekend getaway or the city you retire to, the city is full of charm and history. Just walk down its cobble-stoned streets to one of its boutiques, shops, or restaurants and see for yourself. If you are a seafood lover, then you are in luck. The crab houses go on for miles. More than being the perfect home for history buffs and foodies, Baltimore’s harbors host some of the most breathtaking views. It also happens to be conveniently located close to other large cities. Baltimore is within 100 miles of Philadelphia and Washington, D.C. Therefore, taking a trip to one these cities is not out of the question. If you are thinking about moving to Baltimore but are still on the fence about it, we understand. Moving should be an exciting time in your life, but it can also be very stressful. There is much that goes into moving to a new city. Not only must you pack up all your belongings, but you must also think about how to get your car to your new home. This is a very important decision, as it will determine how your move will go. If you hire a reputable auto transport company that sticks true to their word, then your move will go smoothly. How do you know which company to go with? Research is key. Do your homework to read through online reviews, request quotes, and compare services to find the company that is right for you. Learn more by reading How To Choose An Auto Transport Company. When it comes to shipping a car, you have two main options: open or enclosed carrier shipping. Open Carrier: Shipping via an open carrier is the most economical choice, as it is easier on the wallet. These carriers are designed to hold up to nine vehicles at one time, generally making the process much faster. It is important to remember that these carriers are open to weather and road elements. Enclosed Carrier: Shipping via an enclosed carrier offers the most protection but at a higher price. The car will be transported in a fully enclosed transport carrier, where it is shielded from all weather and road elements, such as dust, dirt, and other debris. Read all documents, carefully. Make sure everything is noted as it should be on the contract. Do not sign on the dotted line if you have questions about payment, services, etc. Asking questions help prevent a bad experience from occurring. You must prepare the vehicle prior to its journey. To do so, remove all personal belongings from the car, keep 1/4 tank of gas in the car, and perform an inspection before the driver’s arrival to note any pre-existing damages. Learn more by reading Prepare A Car For Shipping. The city has a lot to offer. Baltimore gives its residents that small-town feel with many of the perks of a bigger city. You get that sense of community through its annual festivals and events. In addition, its great school system makes for a great place to raise a family. Food. Baltimore residents are very particular about how their famous crabs are eaten. They should be steamed, covered in Old Bay, and piled high. If you are not willing to eat crabs by hand, they suggest you stick to crab cakes. Entertainment. Several hit television shows and movies were filmed in Baltimore, even though the shows were not set there. Sports. Baltimore residents love their baseball, lacrosse, and football. Babe Ruth was even from Baltimore. Residents celebrate this by watching sports and drinking beer. Science. Baltimore is big on STEM. About a quarter of all of the jobs in Baltimore are science, technology, engineering, or math-related. Music. Baltimore has a lively music scene. They have a lot of orchestras, rock bands, hip-hop artists, and jazz musicians. In Baltimore, residents experience all four seasons. Summer can range from mild to hot with some humidity. However, the average tends to stay in the mid-70s and very rarely reaches above 90 degrees. Winters come with bouts of cold rain and snow, but typically stay within the mid-30s to low 40s. Spring and fall bring sunny days and cool nights but can change at the drop of a hat. 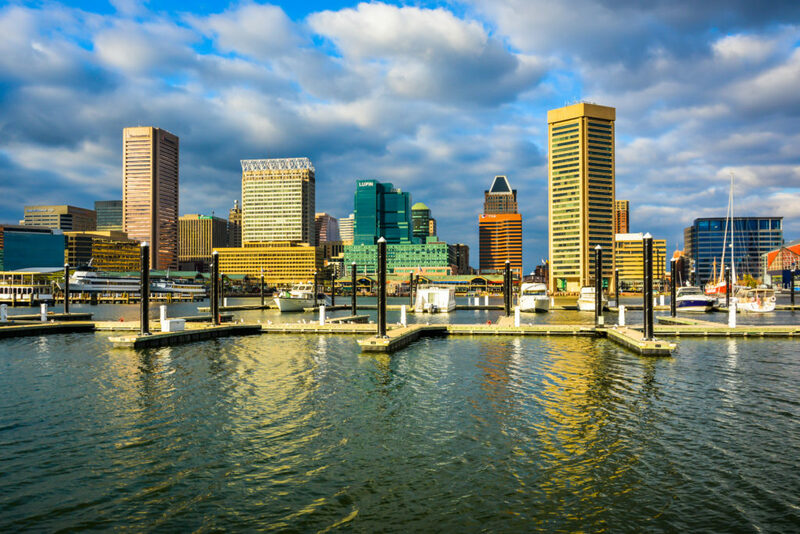 Baltimore is known for being a comfortable state to live in, with more sunny days than the national average. The cost of living, in Baltimore, is lower than several surrounding metropolitan areas and just slightly under the national average, making it a great area for people who want to live in the city but cannot or do not want to pay for places like Washington D.C. or New York. Other things to keep in mind about the cost of living include groceries, transportation, utilities, and health. Groceries tend to be more expensive than the national average, while utilities and transportation are just slightly higher. Before moving to a new home, it is important to consider the size of the area to see if it is a good fit for you. Some people prefer smaller cities, while others prefer larger ones. Baltimore is the largest city in Maryland. There are over 620,000 people living in the city. The median age of people residing in the city is in the 30s. People come to Baltimore for a wide range of reasons, including work and school. There are fourteen colleges in the area, so a fair portion of the population is made up of students who attend one of these colleges. National Dispatch is a leading provider of auto transport services. If you are in need of car shipping services, request a free, instant car shipping quote today. No personal information is required. You can also call us at 800-321-2051. When it comes to moving, there is so much to do, even after you have picked a reliable car shipping company. There are other services that you must concern yourself with, as well. First off, who will get your belongings to your new home? Second, who will you take your car to when it needs to be cleaned? Check out our list of recommended businesses in the Baltimore area.